You know what happens when you travel most of the summer and the only camera you use to take photos is your phone one? You don’t? I didn’t either until it happened to me. You forget your DSLR camera settings and take some rubish photos. I remember seeing some mouth-watering recipe using these spiced chocolate candy last year but in my neck of the woods there were nowhere to be found. Last week while doing some grocery shopping I spotted with my brown eyes the Halloween corner at the local store and went to check it out. To my surprise, there they were, shelves filled with tons of candy including Hersey’s Pumpkin Spice Kisses. After eating almost a whole bag (some taste testing was mandatory) idea of a cake with kisses started to develop in my head. Since I associate fall with blondies, it wasn’t far until I decided to bury some of these irresistible kisses in the blondies batter. 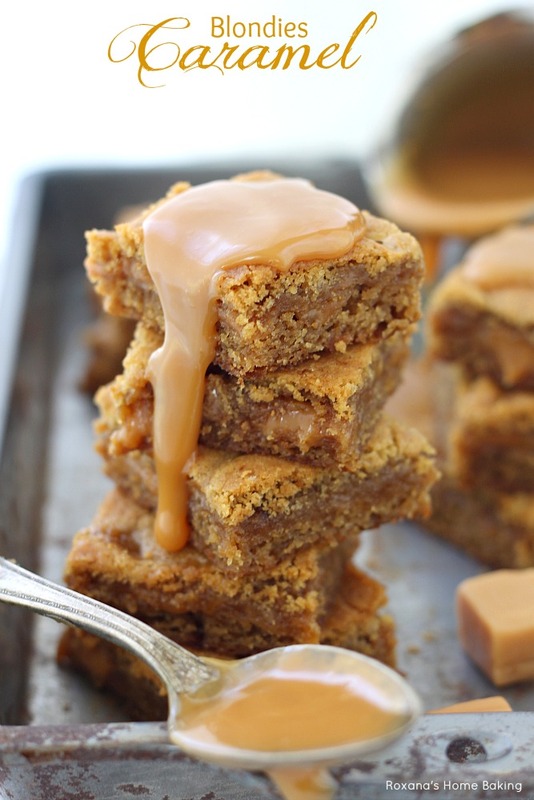 If you don’t like the idea of having candy in your blondies, you can leave them out, but you’re missing out! Pumpkin spice kisses hidden in a light blondie spiced up with a touch of nutmeg and cinnamon. Heat the oven to 350F. Line an 8X8 baking pan with parchment paper and set aside. Add the two eggs, one at a time, mixing well and scraping the bowl after each addition. In a separate bowl sift the flour with the baking powder, cinnamon and nutmeg. Slowly add the flour mixture to the wet ingredients. Stir to combine. Pour the batter into the prepared pan and added the pumpkin spice kisses, pressing gently. 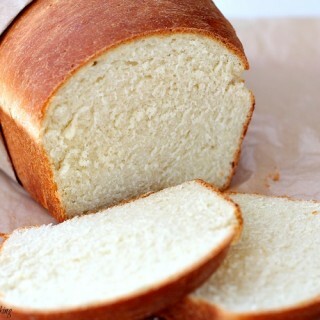 Bake for 23 minutes and leave to completely in the pan. 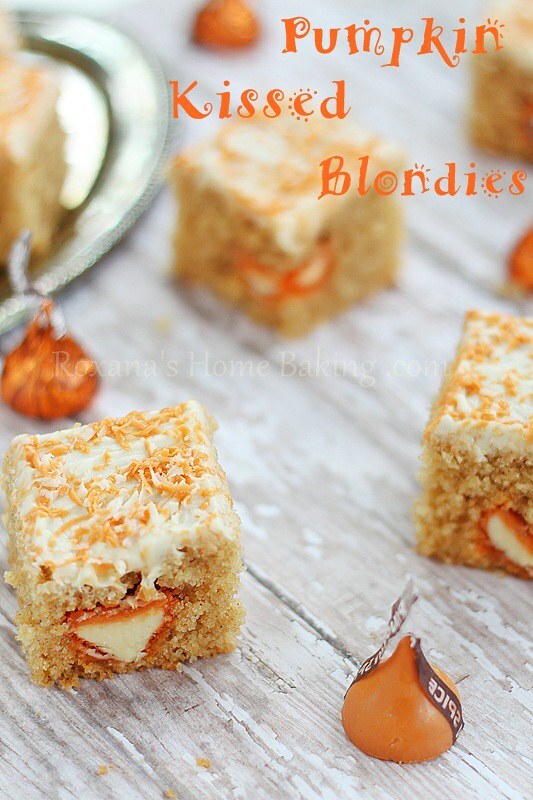 When cooled, melt the white chocolate candy, spread over the blondies and grate the remaining pumpkin kisses. 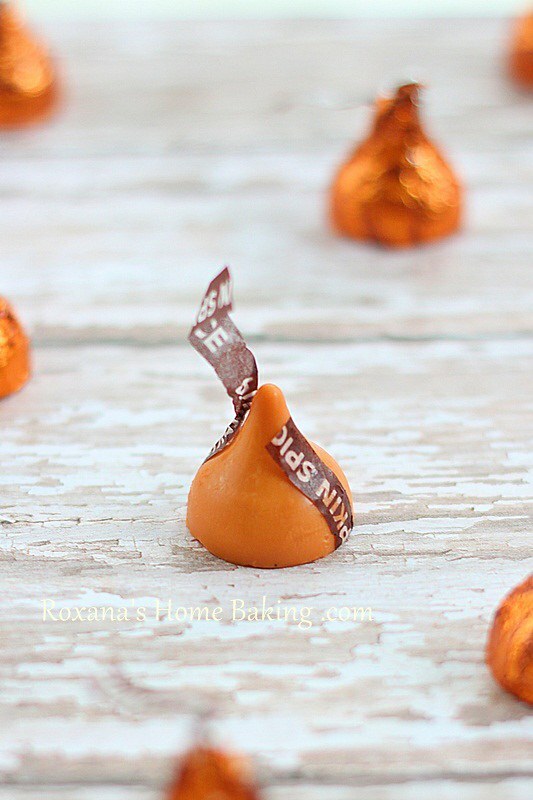 How adorable these pumpkin kisses! These blondies look irresistible. 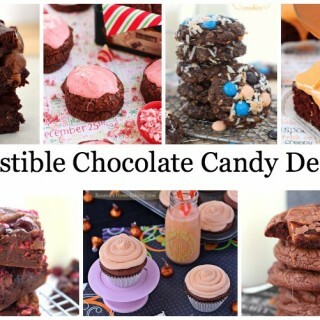 Yum, these look heavenly! Taste testing is a rough part of the job, but someone has to do it ;). this has me written all over it! Pumpkin, blondies, kisses! I am hooked. I'll swap you my zucchini sandwiches for this! LOL! I have never seen these kisses before. Totally need to find them - so many ideas! I have never seen these kisses, but I'll look for them now! 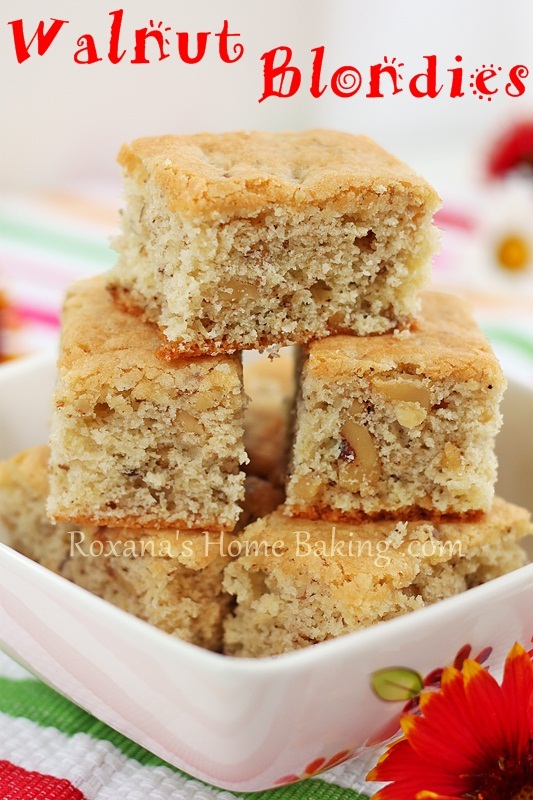 I love blondies...and the surprise in the center make these irresistible! I didn't even know there were pumpkin spice kisses! 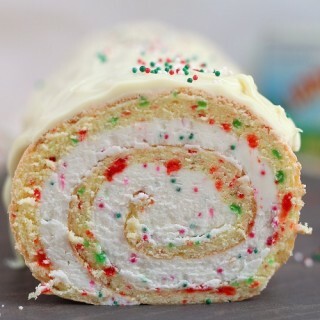 I'll have to try to find some now, this looks amazing!! oh wow. 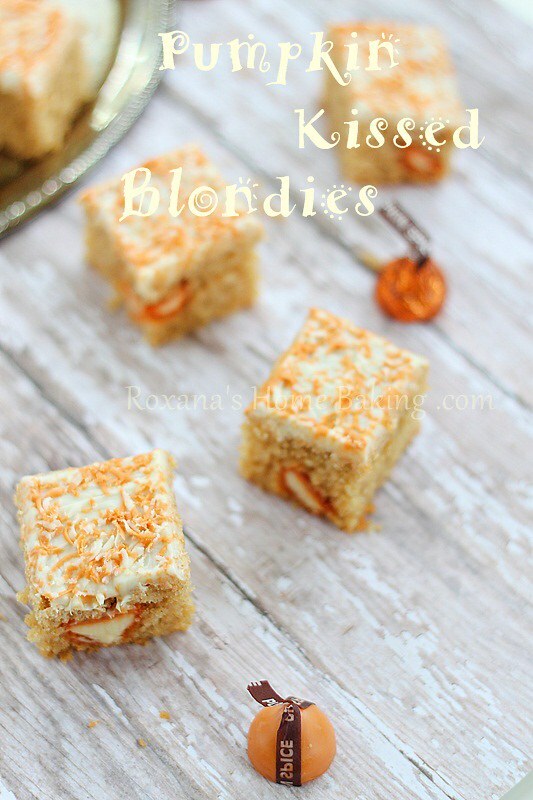 pumpkin kisses.. these blondies are genius! These bars look amazing and they make me so excited for fall! Oh these photos are delectable! At least in my mind! And I can't believe it is already time for pumpkin season. How exciting! Thank you for sharing! I just adore your pictures. They are truly mouthwatering. I feel like I could jump in and take a bite! Okay it's me! I haven't tried these kisses yet. Pumpkin spices? That's real fancy like my favorite latte. I'll have to check it out and your blondies... oh wow you know how to use the right ingredients for delicious baked goods. Looks really good Roxana!! I d surely love some too Roxana! They look wonderful and making my own batch will come handy. My husband is going to go nuts for those. Wish u a lovely weekend! Where did you buy the pumpkin spice kisses? I have been looking around for them but havent seen them yet this year. Hi Gabe, I bought them from my local Wegmans. I rarely shop elsewhere so I don't know what other stores carry them. They look so good! Pinned! Those Kisses - mmm, need to get my hands on them! 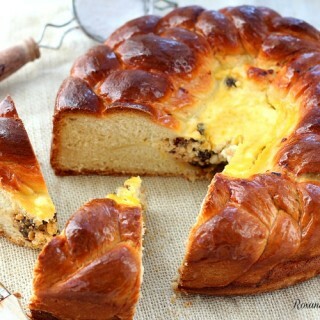 can i replace Whole Wheat Pastry Flour with regular flour? Hi Rebekah, you could use regular whole wheat flour of just all-purpose flour. ahhh these look so good. i love anything pumpkin. I'd forgotten about these fun Kisses. Your cake looks scrumptious! Thanks for the link love. These are so adorable! We added them to our Tasty Tuesday Welcome Fall list & can;t wait to see more! I have half a bag of these kisses left and trying to find recipes that aren't blossom cookies. Looks like I found a winner!! What a fun way to change up blondies. Thanks for the link love! 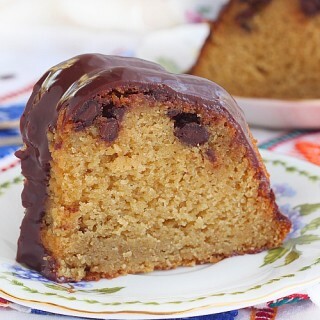 Can I substitute whole wheat flour for cake flour?? and if so, how much would I need?? Thank you!